Sarpaneva endows the Korona Northern Lights with a sandwich dial and a powerful coat of Super-Luminova, giving it the green, blue or violet colours of the Aurora Borealis in the dark. 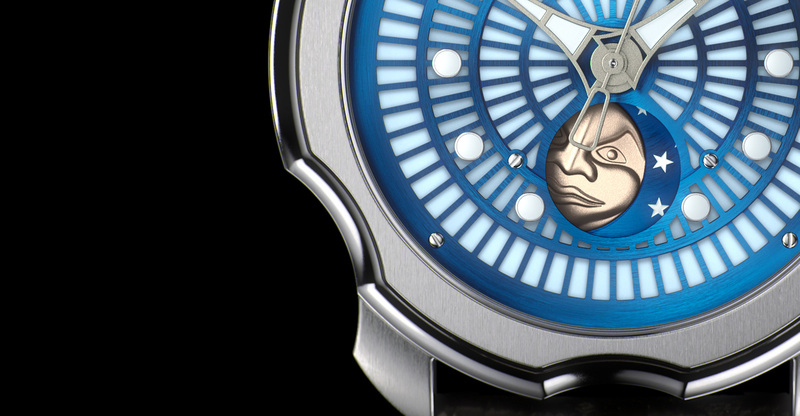 A variant of Stepan Sarpaneva‘s signature moon phase wristwatch, the Korona K01 Northern Lights combines the Finnish watchmaker’s strikingly expressive moon face with a radiant Super-Luminova dial. 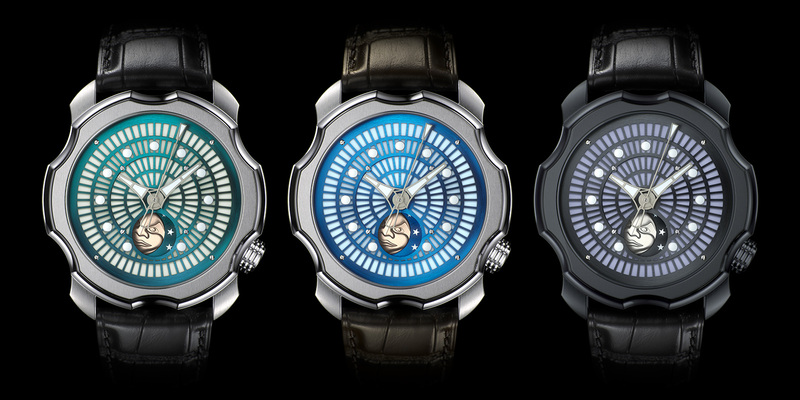 A sandwich construction gives the dial two layers, an open-worked dial on the top and a Super-Luminova coated disc below, giving it a blue, green or violet glow in the dark. 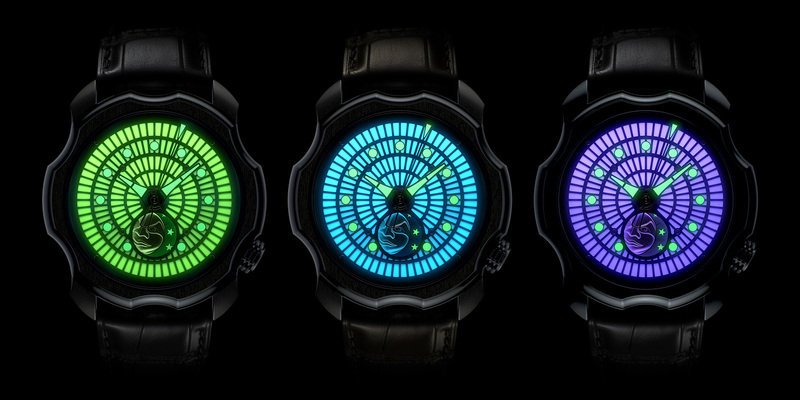 Sarpaneva worked with Black Badger Advanced Composites, a Swedish maker of carbon fibre and titanium jewellery, to create the Super-Luminova dials; Black Badger also decorates its rings with the same luminous material. Each of the three dial colours is coated to match the colour of the Super-Luminova, with the distinctive moon phase disc made of 18k red or white gold, just as it is on every other Sarpaneva watch, including the MB&F Moonmachine. The Korona K01 Northern Lights has a 46 mm steel case, with a Soprod A10 automatic movement inside. Here the movement has been modified to have the moon phase disc replace the date, with slightly different gearing required so that the moon disc makes one revolution every 29.5 days (a date disc takes 31 days to make a full circle). And the rotor is inlaid with a moon face and weight in 18k gold. Three models of the Northern Lights are available, green, blue and violet. All have steel cases except for the violet, which is black coated. 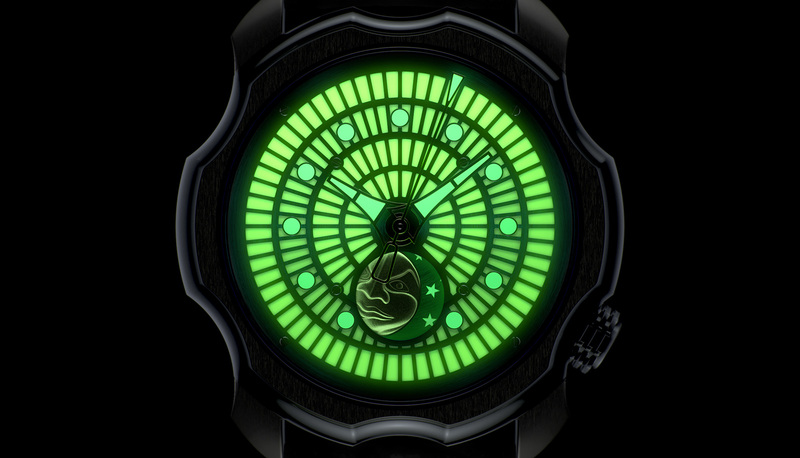 The Sarpaneva Korona Northern Lights is priced at €14,500 before taxes.